The list below is for our mountaineering trips in areas such as the North Cascades, Ecuador, and winter trips to the Adirondacks, Katahdin, or Mount Washington. Please keep in mind that the equipment you choose to bring can greatly affect the quality of your experience. Each trip and climb is slightly different, please discuss the objectives with your guide and adjust accordingly. During our trips we will try to spend a great deal of time the mountains. In order to maximize our time there, everyone needs to travel as easily as possible while still carrying needed gear. In general you should select lightweight equipment, and avoid carrying anything extra that can be reasonably duplicated by other items you already have packed. 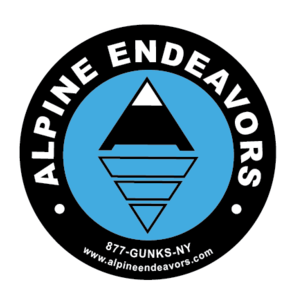 All technical climbing equipment will be provided by Alpine Endeavors. However if you have your own gear, feel free to bring it. Ice Axe* - lightweight and not too long (under 60cm), leashes are generally not used - BD Venom, Grivel Evo, etc. 3 or 4 locking carabiners designed for use with the Munter hitch. Keep in mind that on certain climbs, we may be climbing with all of our gear - so light is right. Pocket Knife/tool - for repairs, etc. Repair Kit - crampon adjustment tools, etc..
• Freeze dried mountain dinners will be provided. You need to provide breakfast and lunches. Wear items that you can move comfortably in and try to layer when possible, NO COTTON! Shell parka with hood - Gore-tex, event, etc. Wicking top and bottom first layer - capalene, bergaline, merino, etc..
A large insulated parka to go over all the clothes you have on to keep you warm while you are standing around.